A quarterly Welsh language cultural magazine. It was established in 1845 and published by Thomas Gee under the editorship of Lewis Edwards and Roger Edwards. Its main content was theology, philiosophy, sceince, education, literature and history. Although intended to be non-denominational, its main supporters were the Methodists. 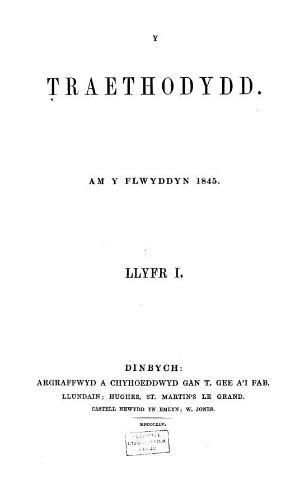 Amongst its editors were Daniel Rowlands, Ifor Williams, J. R. Jones and J. E. Caerwyn Williams. In more recent times the magazine has become more literary, publishing poetry, essays and criticism alongside articles discussing theological and philosophical issues.